The events of September 11, 2001 and its aftermath have provided an opportunity for Muslims, right in the midst of their pain, loss, grief and daily harassment and humiliation, to come out with full vigor and enthusiasm to present Islam to non-Muslims in America and Europe. For, American and European non-Muslims today are filled with curiosity about Islam, as perhaps never before in history. So far, their interest in Islam was peripheral, passing and intellectual at best. Now, of necessity, it has become deep, personal and emotional. This is the right time for the non-Muslim Americans and Europeans to find out what exactly it is that Islam represents and who exactly are the people they have come to know as Muslims. For, what America and Europe need today, more than ever before, is truth – more than anything else about Islam and Muslims. And truth is what the Muslims have in their possession. Truth with regard to who they are and what they do as well as truth with regard to what Islam is and how it operates in today’s complex world, especially in modern-day America and Europe. In its final and complete form, Muslims have the truth of al-Islam in their hands. For, Islam itself is truth. It is al-Haqq – absolute truth – from God Almighty – the lord and master of Muslims, Jews, Christians and all others. This is the time for the Muslims of America – and Muslims throughout the Western world – to stand tall and present the truth of Islam to the non-Muslims around them. It is time for them to let the world see the true face of haqq – truth – as it exists in reality, unalloyed and unmitigated by personal considerations and political interests. Truth then shall set everyone free. 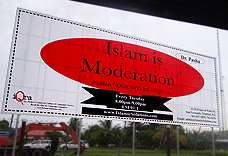 It shall set non-Muslims free from their prejudice, suspicion, loathing and hate for Islam and Muslims. And it shall set Muslims free from fear, self-doubt, sense of inferiority, guilt and all the other damaging effects that arise out of perpetual misinformation, propaganda and demonization that are directed against Islam and Muslims. Thus will be ushered in a new era of peace, security, love and mutual respect for all – non-Muslims as well as Muslims. The only losers in such a win-win outcome – win for Muslims; win for non-Muslims – will be those who hate truth for their own personal reasons and want to cover it up. Such people, on account of their antipathy to truth, are friends of neither Muslims nor non-Muslims; of neither America nor of the rest of the world. Muslims in America have already done many things to reach out to the non-Muslims in this hour of crisis. They have donated blood generously; they have volunteered to help; medical professionals among them have offered their skills; they have raised funds; and they have organized Open Houses in mosques. An Open House in the local mosque is another effective way in which American and European Muslims can reach out to the non-Muslims in their communities. This is a simple idea, but, if Allah wills, it will have a profound impact. I have been toying with this idea for several years and even completed a manuscript or so. I gave a manuscript to some individuals and groups at that time to be published, but the project never materialized. It appears Allah has decided that it should be published now in the context of the tragic events of September 11. The following pages, therefore, present some ideas on what an Open House really means in the context of Islam and on how to do an Open House for a local mosque in a Muslim community. The very first thing the Muslims must know is that they are a people with a mission. And, even though at present we are talking mostly about North America, this mission really transcends geography – as well as time. That means, no matter where the Muslims are geographically, and no matter at what particular point they are in history, this was, is and always will be their mission. The essence of that mission is this: To treat the people around them in the most wonderful, helpful, courteous, caring and respectful manner and, in the process, show a better way of life. A cleaner, healthier and more wholesome way of life altogether. A way of life whose foundations are peace within oneself; peace with God; and peace with God’s creation all around. And – as a result – a way of life that creates peace on earth. And, above all else, truth – what the Qur’an calls haqq. For friend as well as for foe. For Muslims as well as for non-Muslims. Muslims cannot escape this mission, regardless of where they are. Or at what point in history they are. And Muslims must carry out this mission through both practice and precept. Through personal example as well as through teaching and explanation. But no matter how they do it, it must be done in a manner that is user-friendly. For, that is the way of Islam: user-friendliness. Islam is the ultimate user-friendly system of thought, belief and behavior in the world. As a result, the way of life advocated by Islam is based on genuine love, respect and concern: not only for self but also for others. And on endless patience and perseverance. And it embodies a spirit of great gentleness, and kindness, and tact. Always saying the good word.